Today I was on my own. 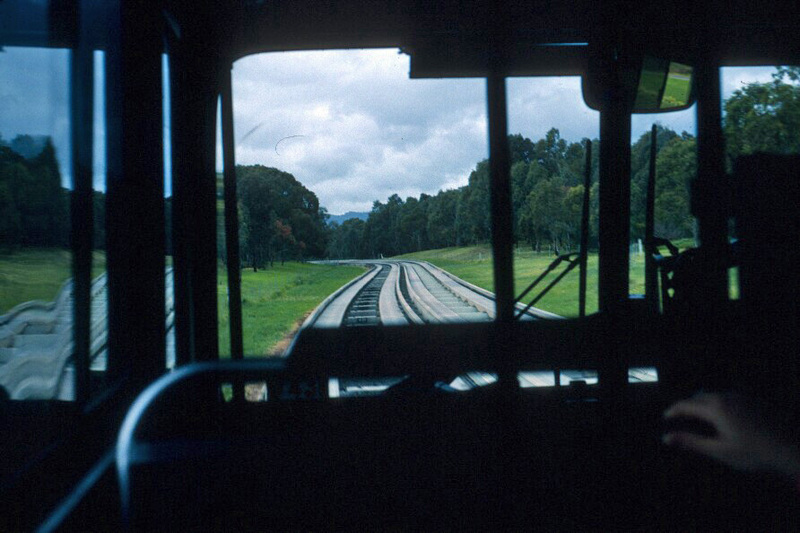 I headed into Adelaide on a mid-morning train. Adelaide has changed the least of all the towns I’ve been to so far—and the changes that have been made fit in pretty well. Hence, it was all comfortingly familiar, and I had no problem finding my way around town. I headed for the Victoria Tourist Center, to get information for my drive next week, and then headed off to pick up a few more gifts for folks back home. After that, I was free to wander and see the sights. 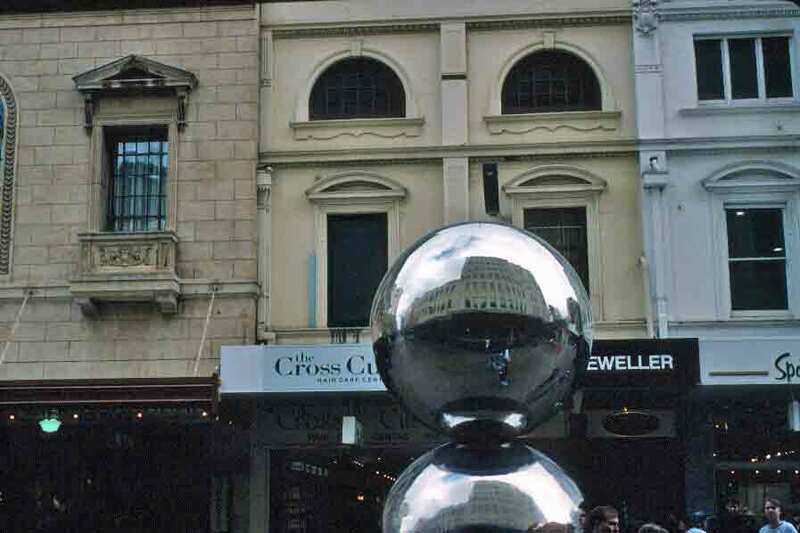 I headed up King William Street and around Victoria Square, then I cut down a side street and window-shopped the length of bustling Rundle Mall. I crossed to North Terrace and walked down to the Henry Ayers house. Though I’d passed it often on my previous trip, I had never toured the splendid bluestone mansion, so I took this opportunity to do so. 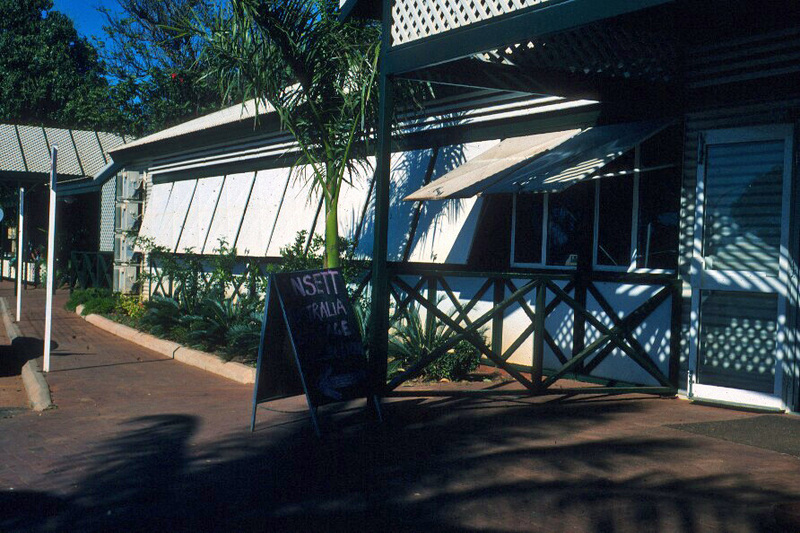 It is said to be one of the best examples of Colonial Regency architecture in Australia. Begun around 1845 on a less ambitious scale, it was later purchased by Ayers and considerably enlarged. Ayers, who came to Australia as a nineteen-year-old law clerk, had made his money in the Burra Copper Mines. Once he was well established financially, he went into politics. He ended up being elected premier of South Australia a record seven times. He is, of course, the person for whom that iconic symbol of the outback, Ayers Rock, is named (largely because, back in the mid-1800s, what is now the Northern Territory was still considered, at least legislatively, part of South Australia). The massive chandeliers and vaulted, hand-painted ceilings were clearly meant to impress. The antique furniture, silver, paintings, and all other items of use or decoration were all astonishingly lovely. It was not hard to imagine the grand parties, luncheons, and balls for which Ayers become known. One dear, older lady who works at Ayers House as a docent took me in hand, as I was alone, and spent about 45 minutes showing me things in obscure corners and out-of-the-way places in the house, sharing insights about who would have been there when and what it all meant. Wonderful. Aside from enjoying the information, I’m always delighted by the enthusiasm of those who get caught up in the history and details of a place or time. I didn’t get any photos of the imposing exterior of Ayers House, and photos weren’t permitted inside. However, I did find this video of the interior of the state dining room on the occasion of a performance by British guitarist Jonathan Prag, so at least you can get a hint of the grandeur of the place. Leaving Ayers House, I continued down North Terrace to the beautiful Botanic Gardens. I had come for the greenery, but smiled at the connection with the place I’d just left; Ayers was Governor of the Botanic Gardens Board for 35 years. I wandered for about half an hour among the old trees, flowers, and ponds. At one pond, there were a couple of swamp hens in the water, and I noticed that the color of their orange faces matched almost exactly the color of the large carp in the pond. I then headed back through town, stopping to buy chocolates for Louanne, Rae, and Bert. 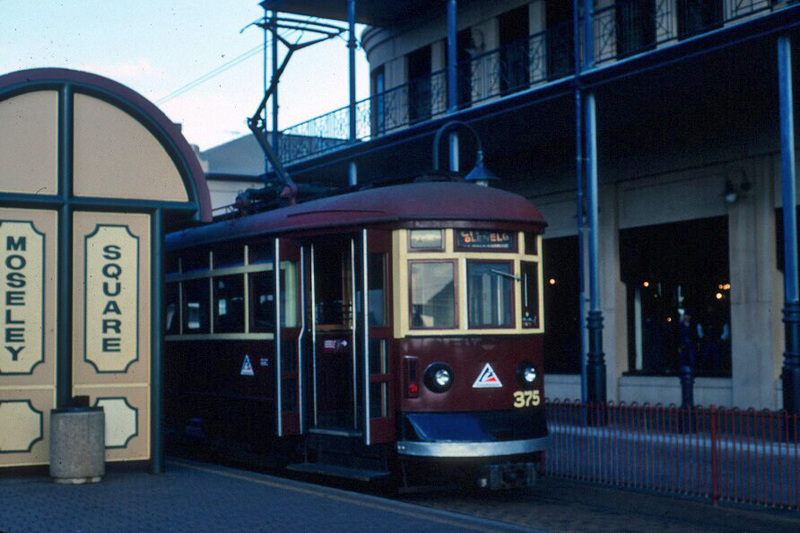 I headed for the train station and traveled out to North Haven, where I joined my friends for supper and another evening of Aussie TV. Back in January 2008, I introduced you to explorers Charles Sturt and James McDouall Stuart, including both in the entry to make it clear that Sturt and Stuart are two different people, not a typo. Of the two, James McDouall Stuart would become the more important—and would, in fact, open up a route to the north that would make it possible for Australia to connect to the world. Technically, John McDouall Stuart was not the first person to cross Australia south to north. That honor belongs to the Burke and Wills expedition. But two things established Stuart as the greater explorer: he actually blazed a useful trail across the continent, and he survived his trip. It took Stuart several years of exploring the remote regions of South Australia to find a viable route north, but by October 1861, he was ready to make the crossing. 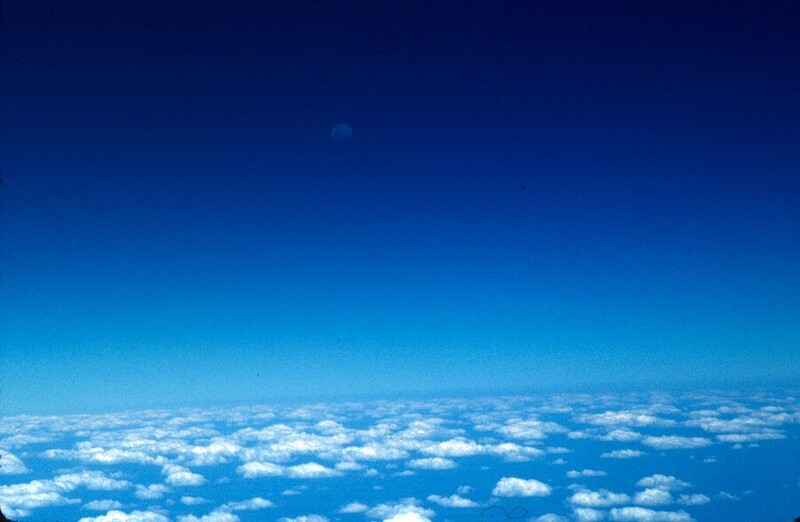 Eight months later, on July 24, 1862, he reached the Indian Ocean near present-day Darwin. The reports and maps with which Stuart returned opened up the Northern Territory. The British Government was so impressed, it added the entire region to South Australia shortly after Stuart’s return. By 1872, the Overland Telegraph had been strung across the continent, closely following Stuart’s route. This wire stretched across the outback, from Adelaide to the Indian Ocean, linked Australia to England and the world. The names of South Australians—from supporters of Stuart’s expeditions (Finke, Chambers) to politicians (Ayers, Todd) still dot the Northern Territory. 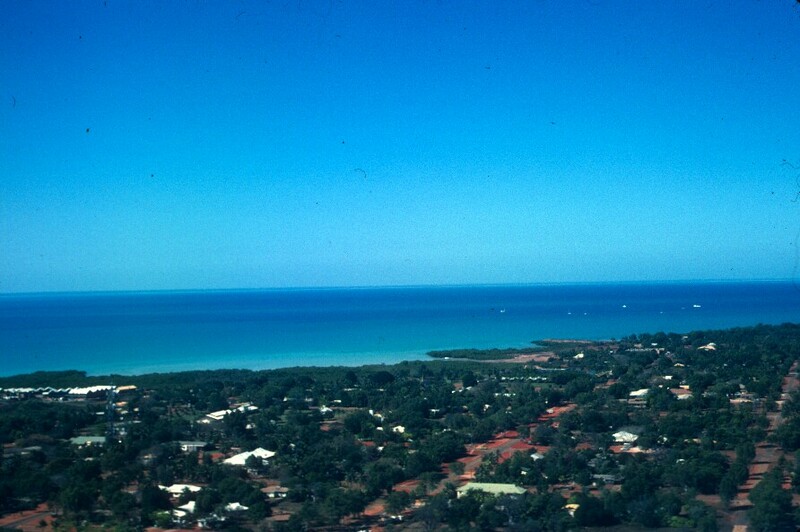 However, South Australians felt the region was far too large to handle effectively, and the Northern Territory eventually got its own local government. Though Stuart returned to his native Scotland for his remaining years, his name is still strongly linked to both South Australia and the Northern Territory. 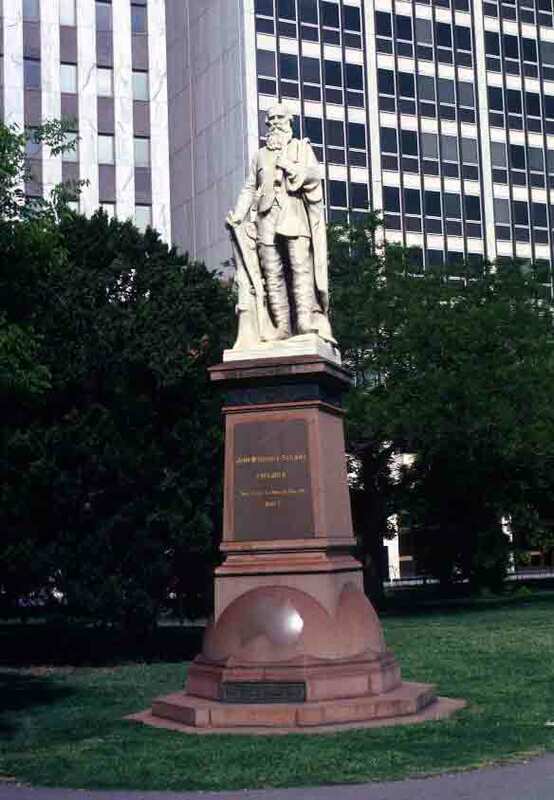 The statue of Stuart shown below is in Adelaide’s Victoria Square. 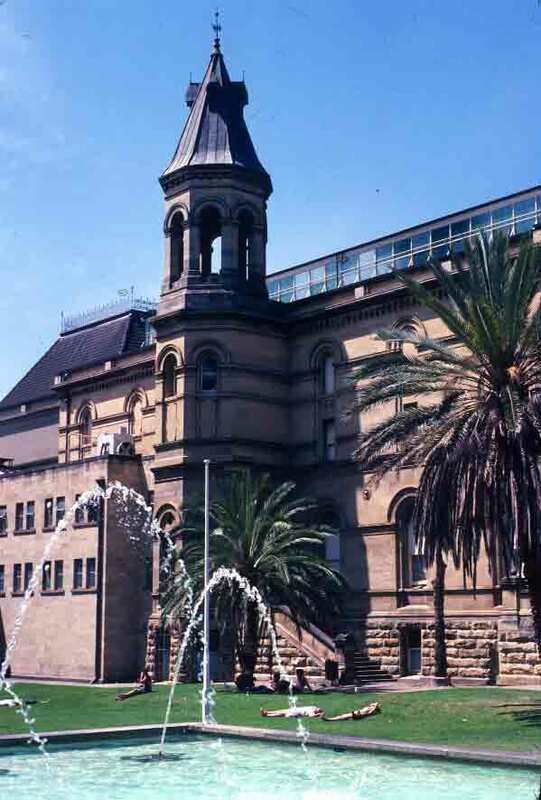 Adelaide’s North Terrace, one of the boundary roads of the original city planned by Colonel Light, is not the only place one finds impressive buildings in Adelaide, but it does offer one of the city’s most concentrated collections of imposing architecture. Lining this handsome, mile-long boulevard one finds Parliament House, the University of South Australia, Ayers House (the former mansion of a past governor of South Australia), the Art Gallery of South Australia, the South Australian Museum, and more, interspersed with fountains, churches, and monuments. The architectural styles almost make North Terrace look European—except for the palm trees. While I ran out of time on my first trip, and didn’t get a chance to visit more than a couple of these North Terrace destinations, I have had the good fortune to explore most of them on subsequent visits. The collections were excellent, and filled with “old friends” from my studies. 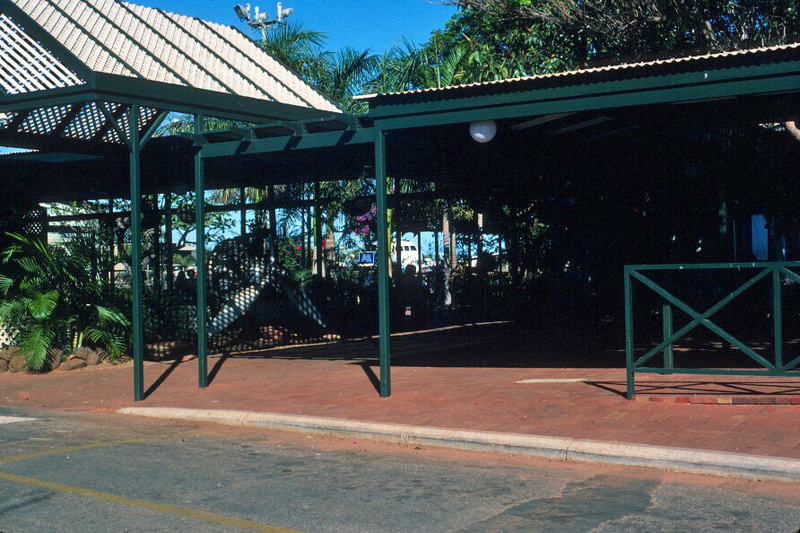 Each place deepened the layers of information and understanding I have absorbed about Australia and its history. But on that first trip, I simply strolled along North Terrace, admiring them, as I headed for the impressive Botanic Garden. There are simply too many things to do in one trip. At the heart of every large Australian city, there is an attractive pedestrian mall—but Adelaide’s Rundle Mall was the first. As is true of most of these pedestrian-only streets, Rundle Mall is lined with department stores, boutiques, specialty shops, book stores, and eateries (coffee shops, delicatessens, restaurants, milk bars, and food courts). When I was there, Rundle Mall was also dotted with booths and stands selling fresh fruit and cut flowers, which added to the generally festive ambiance of the place. The fruit stands in particular became favorite stops on the way back to my hotel. Rundle Mall was a great place for people watching, as it was always filled with a mix of young and old, tourists and locals, serious shoppers and folks hanging out, just enjoying the weather, the street musicians, perhaps a cappuccino, and the general cheerful bustle. In Rundle Mall, while some of the large department stores are newer and more modern, most of the buildings are older and exhibit more traditional architectural design—and provide a handsome backdrop for the modern art that dots the mall. 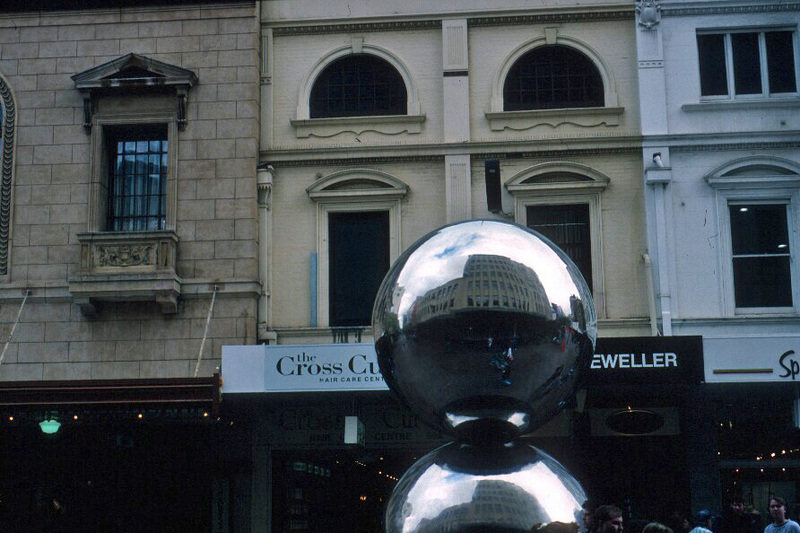 The shiny orbs below are among the most commonly photographed pieces of public art in Rundle Mall—and it’s easy to see why, as it offers you both the view ahead and the reflected view behind.